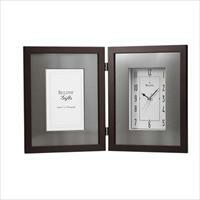 Hinged wood case, espresso brown finish. Brushed pewter finish aluminum inner frame. 4" x 6" photograph opening. Protective glass lens. Hinged metal case, chrome finish. 5" x 7" photograph opening. Protective glass lens. Solid hardwood case. Espresso finish. Beveled glass front. Crystalline revolving pendulum. 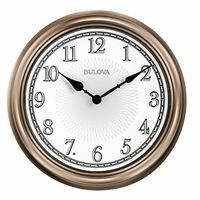 Metal dial. Leaded-glass effect side panels. Requires (2) AA batteries, not included. H: 11.5" W: 9" D: 5.5". 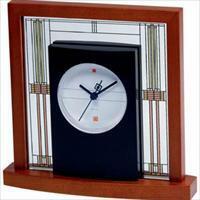 Frank Lloyd Wright ® design. 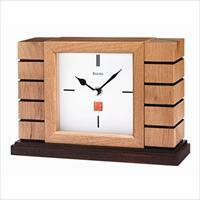 Solid wood case, natural finish. Walnut stain base and accent lines. Protective glass lens. 2.5" x .5" engraving plate included. Based on the "board and batten" walls utilized in the Usonian ® homes, 1936-1959. Solid bamboo case, walnut and natural finish. Chrome and spun aluminum-finish raised chapter ring. Curved glass lens. 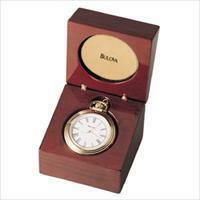 Brass finish metal case. 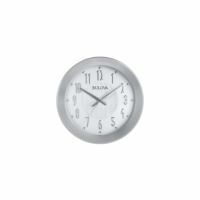 Floating two-tone metal dial with sweep seconds hand. Clear protective lens. Requires (1) AA battery, not included. 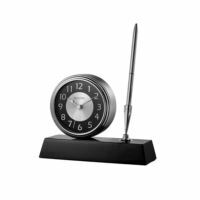 Sleek clock and pen desk-set duo mounted on high-gloss black wooden base. 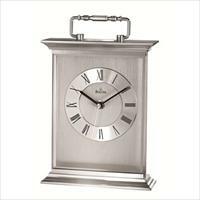 Brushed silver metal clock case is accented with polished silver waterfall bezel. 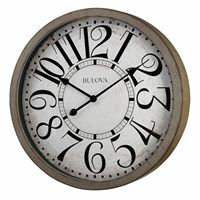 Black and silver-tone metal dial with Arabic numerals and quiet sweep (no ticking) second hand. Silver-tone pen uses Cross-type refills. Protective glass lens. Requires (1) AA battery, not included. H: 5" W: 5.75" D: 1.5", H: 12.7cm W: 14.6cm D: 3.8cm. Brass finish metal case. 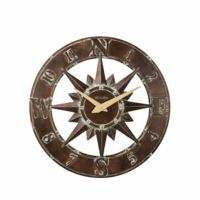 Metal dial with bright polished accents. Clear protective lens. 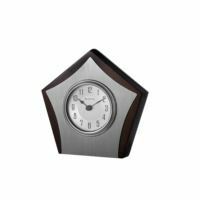 Solid hardwood base with ebony gloss finish holds stylized triangle-shaped clock, embedded in heavyweight K-9 crystal. 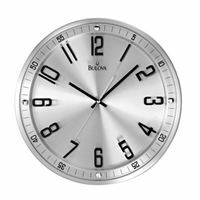 Polished chrome skeleton movement, Arabic numeral ring with diamond-cut radius design, remote seconds hand subdial at the 6 o'clock position. Requires (1) AA battery, not included. H: 6" W: 6.75" D: 2.25", H: 15.2cm W: 17.1cm D: 5.7cm. Solid wood top and base, high gloss piano finish over mahogany stain. Matte black sides. 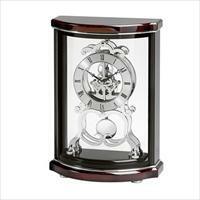 Polished chrome inlaid accents, revolving pendulum and feet. 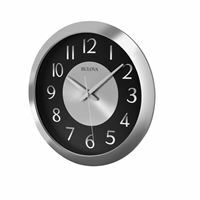 Spun aluminum dial with raised chrome finish numerals on black chapter ring. Removable clear acrylic back panel. Protective curved glass lens. 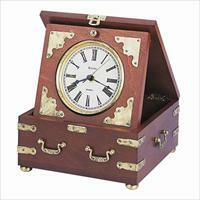 Solid wood and wood veneer case, antique walnut finish. 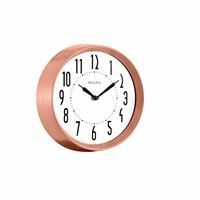 Two-tone metal dial. Westminster melody on the hour. Protective glass lens. Frank Lloyd Wright ® design. 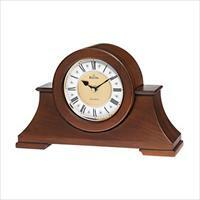 Solid wood case, walnut finish. Geometric wood pendulum. Protective glass lens. Adaptation of window from the Ward W. Willits house. Circa 1902-1903 Prairie-style masterpiece. Solid wood case, Old World walnut finish. Decorative carved accents. 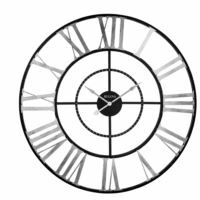 Metal dial. Decorative screened glass front and side panels. Removable clear acrylic back panel. Westminster melody on the hour. Revolving pendulum. Hardwood case in brown cherry. 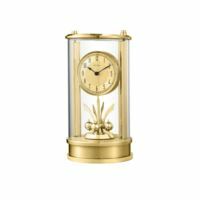 “Anniversary" design features glass with pin-stripe etching, gold-tone pillars on case front and a rotating crystalline pendulum. 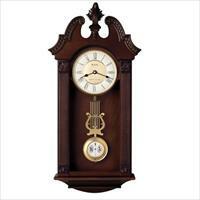 Harmonic 2 triple-chime movement plays choice of Westminster, Ave Maria or Bim-Bam melody on the hour. 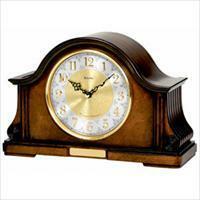 4/4 quarter-hour Westminster chime and strike available. 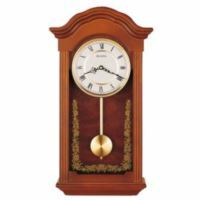 Clock illuminates automatically in low light to accent pendulum. Adjustable volume control and automatic night shutoff switch. Requires (2) AA batteries and (4) C batteries, not included. Solid wood case, antique wiped walnut finish. Decorative carved wood accents. Dual chime German movement plays Westminster or Whittington. Chimes on the quarter hour. Counts the hour. Adjustable volume control. Night shut off. Protective glass lens. Formed wood case, walnut finish. Polished goldtone bezel. 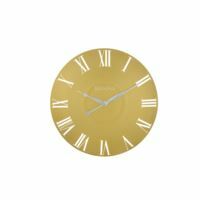 Metal dial with gold metallic accents. Westminster melody on the hour. Clear protective glass lens. Solid wood and wood veneer case, Old World walnut finish. 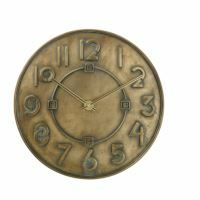 Brass-finish metal bezel. 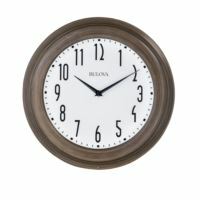 Two-tone metal dial with raised numerals. 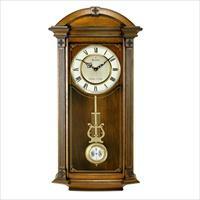 Dual-chime movement plays Westminster or Whittington melody. Movement plays on the quarter hour. Counts the hour. Adjustable volume control. Night shut-off. Convex glass lens. 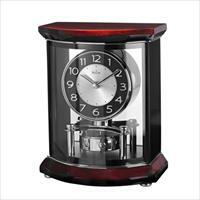 Solid wood base, high gloss finish over black stain. Chrome-finish metal skeleton movement with seconds subdial. 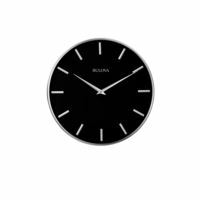 Spun aluminum dial with black Roman numerals. 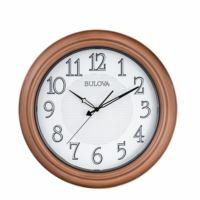 Strikes the hour. Glass inserts in front and sides. Chrome-finish metal accents. Hinged rear door. Solid wood case. 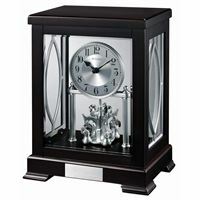 High gloss black and mahogany finish. Polished chrome inlaid accents and feet. 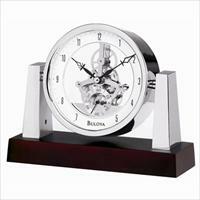 Chrome-finish metal skeleton movement with pendulum. Protective curved glass lens. 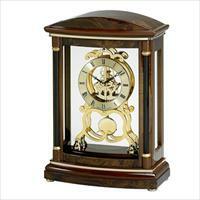 Wood case, ebony veneer pattern with mahogany stain. Brushed stainless steel corners. 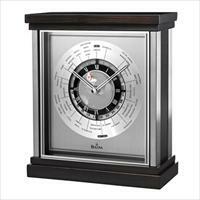 Spun and brushed-finish world time dial with major city markings. Protective glass lens with mirror border. 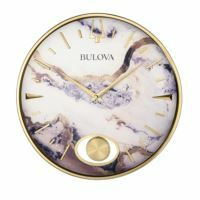 Bulova does a twist on the traditional column clock by adding Mother-of-Pearl like accents to the octagonal posts and clock face. The results are absolutely beautiful. 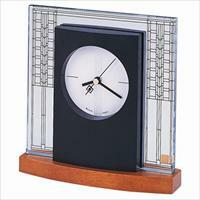 The clock features a quartz movement and sits against a mirrored backdrop. Battery-1 x AA - Not included. Size-6" x 7" x 1.75"
Solid wood hinged case. High gloss piano finish over mahogany stain. Removable pocket watch with engravable back chain. Clear protective lens. 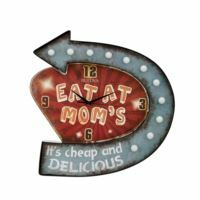 2.5" round brass engraving plate included. 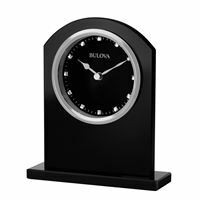 Contemporary tabletop clock crafted of heavy black glass with polished silver bezel, glass lens, and glossy ebony dial accented with crystalline baguettes at each hour position. Requires (1) AA battery, not included. Metal case, brushed silver-tone finish. Ascending volume electronic beep alarm with top shut-off and snooze button. 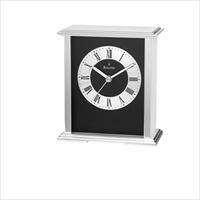 Two-tone silver and black dial with oversize numerals, luminous hands and markers lights up at touch of button. Shatter-resistant protective glass lens. Requires (1) AA battery, not included. 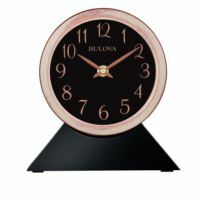 Can double as a desk or wall clock, The Ebony finished hardwood base cradles the 6 inch diameter clock with and aged copper finish, The black dial with contrasting copper Arabic stylized numbers is covered by a protective glass lens. 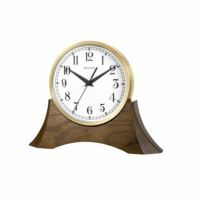 The base offers a large area for an engraving plate (Not included) to personalize this stylish clock. 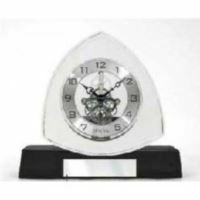 Uses 1 AA battery (not included) Dimensions 7.25" H x 7.35" W x 2.25" D (clock only 6" Diameter) H 18.5cm x W 18.7mm x D 5.7mm Clock only 15cm Dia. Aluminum case and base, brushed finish. Luminous hands. 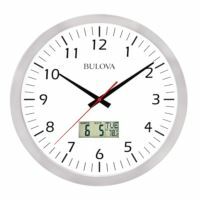 Lighted dial. Beep alarm. Protective glass lens. Solid wood hinged case, rustic walnut finish. Antique metal accents and handles. 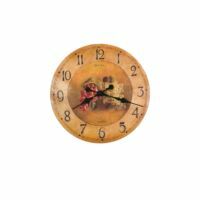 Antique gold-finish bezel. Protective glass lens. Solid aluminum case, brushed and polished finish. 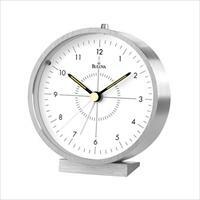 Brushed aluminum dial with raised spun finish chapter ring. Protective glass lens with mirror border. 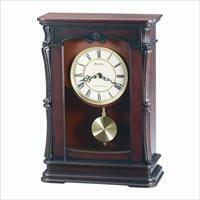 Solid wood base, dark mahogany finish. 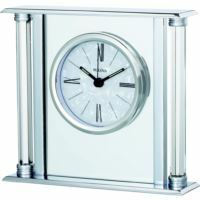 Chrome finish pivoting clock housing and supports. Skeleton movement with seconds subdial. Protective glass lens. Solid wood top and base. High gloss piano finish over mahogany stain. Silver-finish metal sides. 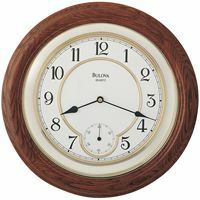 Raised chapter ring dial. 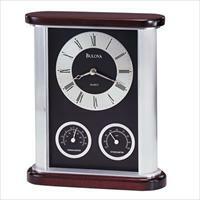 Includes clock and hygrometer. 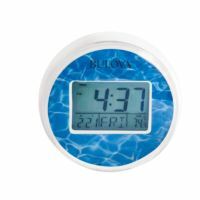 Includes thermometer with Fahrenheit and Celsius scales. 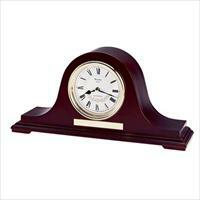 Solid wood case, dark wine finish. Brushed aluminum columns. Polished chrome inlaid accents and feet. Spun aluminum dial with raised chrome markers. Protective glass lens with mirror border. 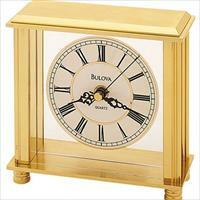 Brass-finish metal case.. Luminous hour and minute hand.. 36-hour key wind.. Bell alarm.. 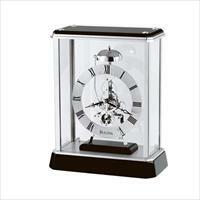 Protective glass lens..
Chrome-finish metal case.. Luminous hour and minute hands.. 36-hour key wind.. Bell alarm.. Protective glass lens..
Metal base, polished brass finish. 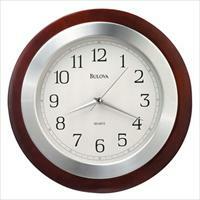 Polished metal dial with spun-finish chapter ring. Glass dome. 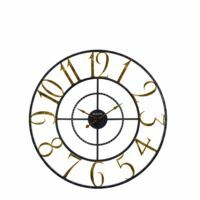 Revolving pendulum. 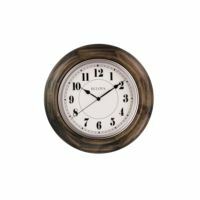 H: 9" Dia: 6"
"C3260 WHITTINGHAMLaminated dial. Antique-style color fruit pattern. Requires (1)AA battery, not included. Dia. : 18"" D: 1.5"", Dia. 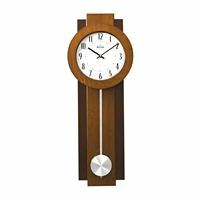 : 46cm D: 4cm"
Wood case, two-tone walnut and mahogany finish. 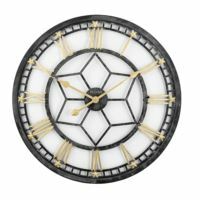 Off-white dial with stylized Arabic numerals. Brushed aluminum pendulum. Protective convex glass lens. Solid wood and wood veneer case, Old World walnut finish. Westminster melody on the hour. Decorative screened glass. 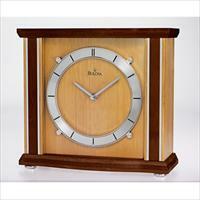 Solid wood case, walnut finish. 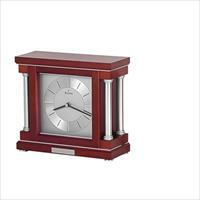 Solid wood top and base, mahogany finish. Decorative black accents. 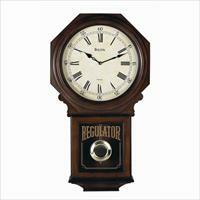 Clock; thermometer with Fahrenheit & Centigrade; hygrometer. 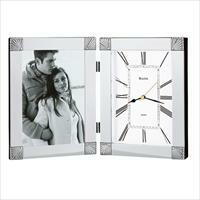 White metal dial with spun aluminum chapter rings. Protective glass lens. Solid wood case, Old World walnut finish. Angled corners with fluted pilasters. Angled corners with decorative carved accents. 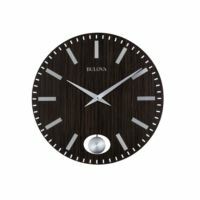 Two-tone metal dial. 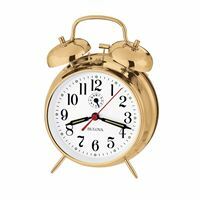 Triple-chime movement. Plays choice of Westminster, Ave Maria or Bim-Bam melody. Plays melody on the quarter. Wood and wood veneer case, antique walnut finish. 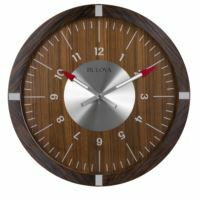 Two-tone metal dial. Goldtone pendulum. Wood framed glass panel detail. 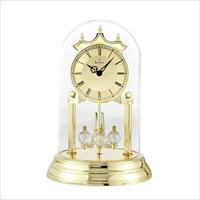 Triple-chime movement plays Westminster, Ave Maria or Bim-Bam chimes on the hour. Counts the hour. Adjustable volume control. Night shut-off. Protective glass lens. 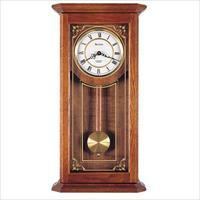 Solid wood case, walnut finish. Decorative carved accents. 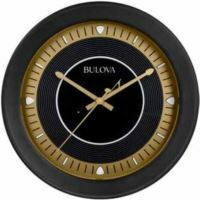 Two-tone metal dial. 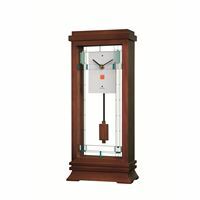 Dual-chime movement plays Westminster or Whittington chimes . Counts the hour. Adjustable volume control. Night shut-off. Protective glass lens. 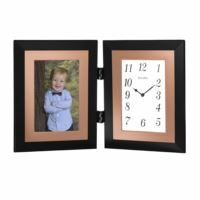 Illuminated outdoor wall clock with a two-step metal case in oil rubbed bronze finish. The movement is sealed with a gasket for protection from outdoor elements. Arabic numerals and instrument graphics are printed with a light reflective ink, then covered with a clear acrylic diffusing overlay. 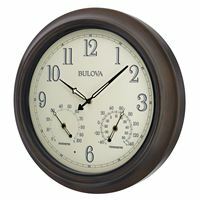 Illuminate at dusk and keep the dial visible until automatically shutting off at dawn. 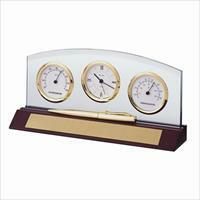 Includes a thermometer with Fahrenheit and Celsius scales and a hygrometer. Requires (1) AA battery for clock, (4) D batteries for LED light, not included. 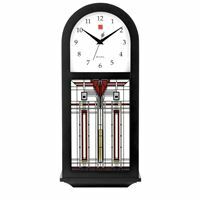 Large wall clock finished in antique-grey with bold stylized accent Arabic numerals and minute markers, and protective glass lens. Requires (1) AA battery, not included. 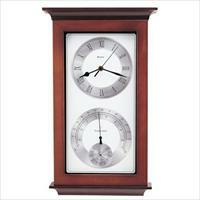 Indoor/Outdoor Clock. 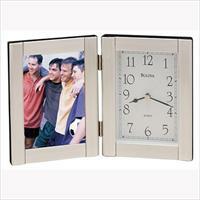 Weather-resistant molded case, champagne finish. Responsive lights automatically turn on/off from sundown to sunup. 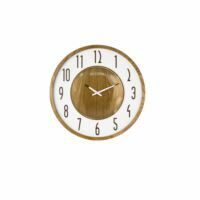 Sealed dial and clock resist moisture and humidity. Shatter-resistant protective glass lens. Requires (1) AA battery for clock, (4) D batteries for power lamps, not included. Gracing a cul-de-sac and overlooking the Kankakee River, the B. Harley Bradley House is a handsome two story home designed by Wright early in his career. Maple veneer stained in an ebony finish. 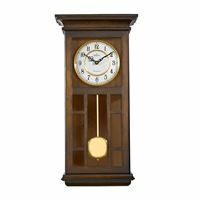 Smaller scale chiming design has a bent wood curved top and a full base. A brass finished rod pendulum swings behind the lower glass panel. 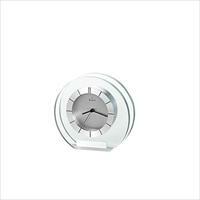 Oversize wall clock with molded case in mirror polished chrome finish. 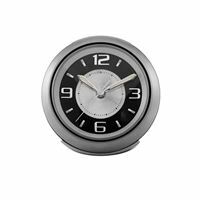 Metal dial features bold Arabic numerals in brushed silver-tone on a black chapter ring. Protective glass lens. 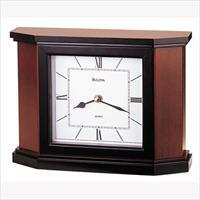 This quiet sweep seconds hand quartz clock houses a Bluetooth® wireless stereo speaker system. Wirelessly supports any type of programming from a smartphone or tablet and transmits up to 30 feet away. Built-in removable Li-Polymer rechargeable battery includes USB cable and universal charger. Power output: 2X3 watt RMS. 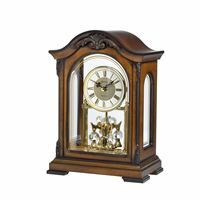 Requires (1) AA battery for clock, not included. The aged metal case spans 5 feet across! 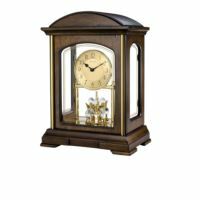 The oversized Gallery clocks will be the focal point of any room it is placed in, the case is accented by antiqued gold numbers to add contrast. 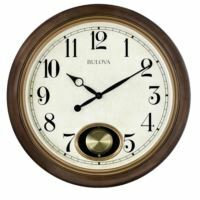 The inner minute ring aids in reading the correct time, The center time disk is separate and allows easy removal once after the clock is hung for time setting and battery replacement with out removing the total clock from the wall. 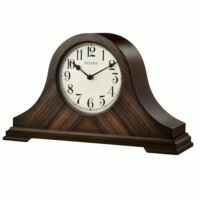 This clock ships in a compact carton and assembles easily to allow for UPS or Fed EX shipping. 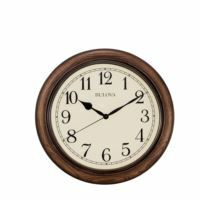 Perfect for indoor or outdoors, oversize 16 3/4-inch diameter clock is weather-resistant and can be used in any location - Patio, Bathroom, Poolside, Office or anywhere in the home. 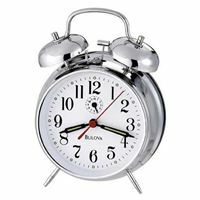 This clock has stereo wireless all weather Bluetooth® speakers through which programming and music can be streamed from any iOS or Android Bluetooth-enabled device.At night or low light conditions, the dial automatically illuminates and shuts off when ambient light returns.